If you have been injured in a pedestrian accident, it is important to contact an experienced personal injury attorney who is skilled in dealing with pedestrian and automobile accidents. If you or someone you love has been struck by an automobile, truck or motorcycle while walking, running or playing, the Hardy, Wolf and Downing personal injury team can answer questions about your case and maximize the compensation you receive for your injuries. The personal attorneys of Hardy, Wolf and Downing have recovered millions of dollars for clients injured in pedestrian accidents across the state of Maine. Our attorneys can help you understand your rights, maximize your compensation and avoid common tactics insurance companies use to deny or minimize claims following a pedestrian and automobile accident. 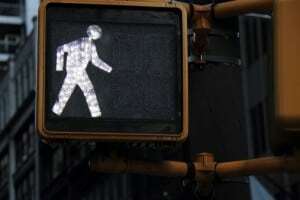 4,2880 pedestrians were killed in accidents in the United States and another 70,000 were injured. In the United States, a pedestrian is injured in a traffic accident every 11 minutes and a pedestrian dies in a traffic related crash every 8 minutes. On average, pedestrians are 1.5 times more likely to die in a traffic-related crash than vehicle occupants for each and every each trip. Although all pedestrians risk being hit by a car, truck or motorcycle, statistics show that some populations are at a greater risk for pedestrian accidents. Older adults (65 years and over) account for approximately 19% of all pedestrian deaths. Almost one in five children between the ages of 5 and 9 who were killed in 2010 were involved in pedestrian accidents. Alcohol was a factor in a large number of pedestrian accidents. Alcohol impairment, for either the driver or the pedestrian, was reported in 47% of the traffic crashes which resulted in a pedestrian death. According to the CDC, of the pedestrians involved, 33% had a blood alcohol concentration of greater than .08 grams per deciliter. In 2010, nearly one in every five children between the ages of 5 and 9 who were killed in traffic crashes was a pedestrian. If you have been injured in a pedestrian-automobile accident, call the experienced personal injury attorneys at Hardy, Wolf and Downing to schedule a free and confidential evaluation of your case. Our personal injury attorneys provide our blog as a service to our clients. They are meant to be purely informational. If you or a loved one has been in a pedestrian accident and would like a free consultation with a personal injury attorney, please call our firm today at 1-800-INJURED to start understanding your legal rights.